Putting your child's future in the hands of a lottery is not something many parents would do willingly. 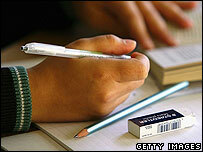 Many parents - particularly in urban areas - plan their secondary school strategies years ahead. Some move house, some find religion, some find tutors for their children. Leaving things to chance isn't seen as a good bet. So it is no surprise that there has been an outcry over a vote for places at some over-subscribed schools in Brighton to be allocated by a lottery. Parents in Brighton have been out on the streets in protest and with families across the country set to find out about secondary school places this week, the dispute highlights the strong feelings aroused by school admissions. Hundreds of parents in the south coast authority have attended public meetings, almost 4,000 people have signed a petition, protest websites have carried the latest developments and tens of thousands of leaflets have been distributed by campaigners. 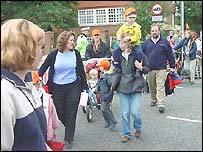 The dispute in Brighton is local - but it reflects tensions that will be familiar to other families around the country trying to find a suitable school place for their children. And it shows how there can be very different views about what is "fair" for individual families and the wider community. In the Brighton example, the council says that it wants to shake up the admissions system to make sure that more children can have access to a local school. As such, it is introducing fixed catchment areas, which will mean that each area will have an allocated school or schools - and effectively stopping children going to popular, oversubscribed schools which are outside their own catchment area. Where there are two schools serving a catchment area, the allocation of places between these schools will be decided by a lottery - so that within the boundaries of a catchment area, there will be no priority given to living closer to a school. There might be parents who are unhappy about the changes, says a council spokesperson, but "this is about what's fairest for the largest number of people". Complicated? These arrangements are always complicated. And because it will affect children's futures there are strongly-held views and deep anxieties. Mark Bannister, spokesperson for a campaign group, Schools4Communities, arguing against the new admissions plan, says the catchment area boundaries will cut some families off from sending their children to their local school. And that fixing boundaries in this way will mean that children from the most deprived parts of the city will be pushed together, polarising social divisions. However, he says that the bigger picture should not be about changing the admissions rules - there needed to be more schools and higher standards to take the pressure out of the competition for places. "We shouldn't have everyone trying to scramble to get their children into one or two good schools. We need to get more capacity into the system, we need to raise standards so that everyone can have a good school," he says. The council says that the changes will "level the playing field" for admissions - in particular helping families who do not live in the immediate vicinity of any school. But for the families trying to make decisions about where they live and planning for their children's future this is a worrying process. Kate Schreckenberg has recently moved to Brighton - and bought a house near to two schools which were her preferred options for her daughter. She is within the "right" catchment area - but still fears that if these schools are oversubscribed, the decision about her daughter's school will be down to a lottery, and that if unsuccessful, it could mean her daughter having to travel further afield to find a place. A supporter of state education, Ms Schereckenberg says that she recognises the conflict between individual self-interest and the wider idea of fairness - but the current dispute has left her unconvinced by the council's arguments. And she questions the way that local political "machinations" are interwoven with the arguments about schools. "There has been much debate about 'choice', but I'm not sure what kind of choice we're really getting. And there's been a lot of talk about 'social justice', but I can't see that here either," she says. And she also questions a system which creates such pressure on the places in the schools seen as the most desirable. But there are other parents who support the proposed changes - who believe that the catchment areas will give more people a chance to get into their preferred local school. Chris Bourne is in favour of the changes, because he says allocating places according to who lives closest gives an unfair advantage to people who can afford to buy a house very near to a popular school. His daughter will be among the first intake under the proposed regulations. "People who live nearest get first bite of the cherry - then everyone else gets what's left over. "This can mean that the children who don't live close enough are shipped all over the place," he says, "breaking up the friendships made at primary school." Using a catchment area and a lottery will give at least some chance of getting into local schools which otherwise would not have been available to children, he says. Everyone is agreed that they want a fair system, it's just that everyone has a different idea of what means fair.